At Cedar Street Design we never think outside of the box! A great gift for that shark lover in your life. 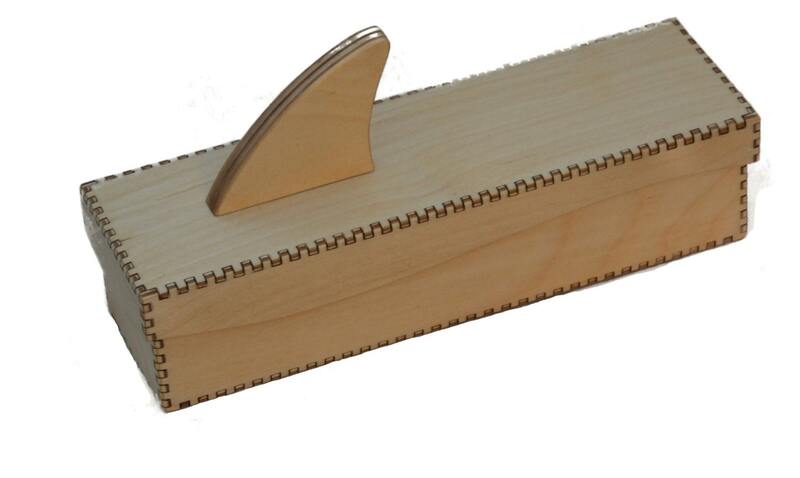 This pencil box features a fin for office cubical fun. 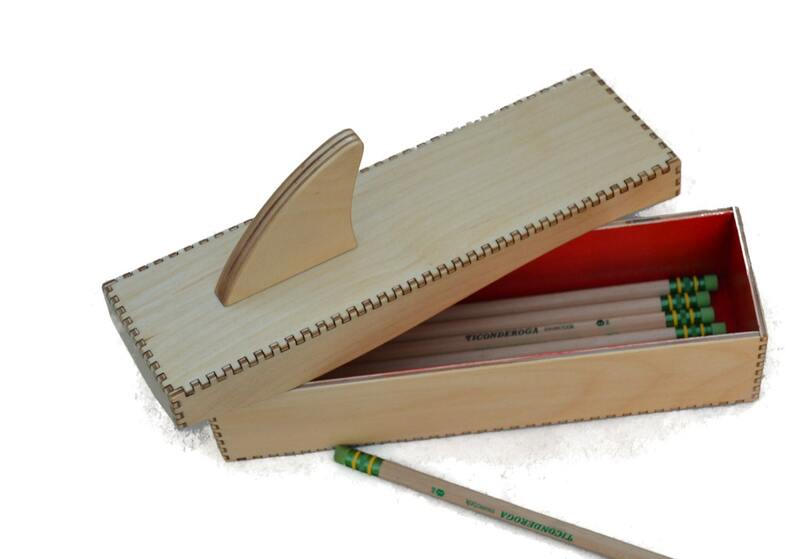 Open the box to reveal the blood red interior and also your pencils. 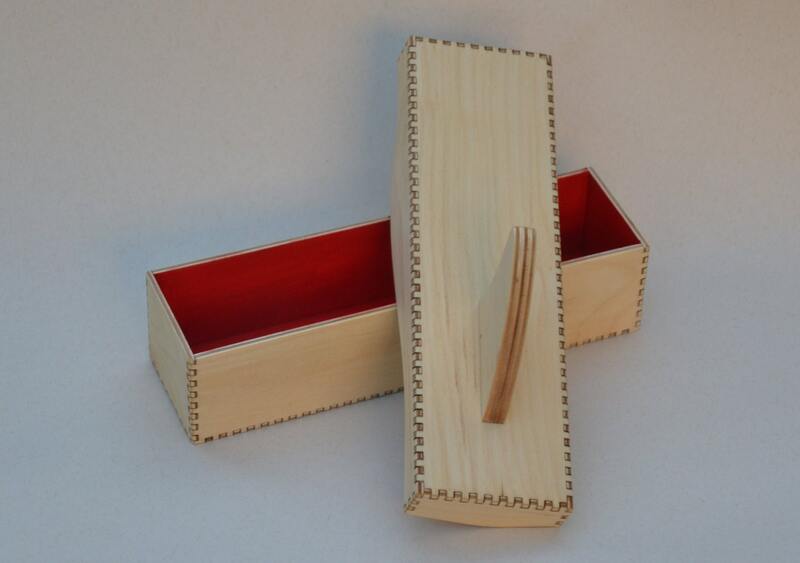 Made from 1/8 inch Baltic birch plywood this box measures 2 inches x 2 and 1/2 inches x 8 and 1/2 inches. The fin sticks up another couple of inches. Finished with polyurethane for years of sturdy shark fun. We accept PayPal or the Etsy payment system. Thru Etsy we collect sales tax for Washington state customers. We ship USPS domestically and internationally. We do not ship a few of our items outside of the U.S. because the shipping would be to high. We do this to protect our customers. If you are for any reason dissatisfied with your purchase you may return it for a full refund including any postage that you have paid for a period of two weeks after you have received your order. We will issue the refund within two working days of the return of the product to us or within two working days of being provided with proof that the product is in transit back to us. Furthermore we will pay you back for the shipping cost to return the product to us provided that you have used the cheapest return method. Check your item(s) immediately for damage. In the unlikely event that your product is damaged in transit, please send us photos of the damaged product and the packaging for insurance and we will replace the item if possible or refund your money. Contact us through Etsy 'convo'. We enjoy doing custom work. We have a number of basic designs that we can customize and many may be surprisingly affordable. Or we can design a completely original box for you! Feel free to inquire. Please note that we hold our custom work to a high standard and spend a lot of time on each design. Most of our custom orders are for more than one box. We specialize in award boxes for significant events and accomplishments and can engrave names and logos on the boxes. We are also very clever at incorporating company logos or themes into our box designs. IMPORTANT! We only manufacture our own custom designs. If you are an artist or crafts person that needs laser cutting for your own work, there are a number of companies such as Ponoko that specialize in this service. They will cut your work faster than our two person shop can. If your are interested in carrying our work contact us. We will only take on a new customer if we are certain we can provide exceptional service. All of our designs, images of our work, text and graphics displayed on Etsy are copyrighted. © 2019 At Cedar Street Design we never think outside of the box!